Try this simple experiment; go out to your car and open the hood. Take a pair of wire cutters. Look around at all the wires under there. Pick one and cut it. Get in the car and start it up and drive around the block. Does the car function better or worse? You have just performed the mechanical equivalent of a genetic mutation, what I would call a vertical mutation – i.e. – the loss or gain of information. Let’s try a horizontal mutation – i.e. – the rearrangement of information. Turn off your computer and open the case. Pick out two wires, any two will do. Unplug them and swap them out; plug the first wire into the second wires connection and the second into the firsts. Put the cover back on and boot the computer up. Does it work better or worse, does it work at all? Ok, let’s try this one on for size; take a 747 Boeing Jumbo Jet; over one hundred miles of wiring – tens of thousands of wires. If I told you I was going to cut just one wire, somewhere on this acre sized airplane , would you still fly on it? If wires aren’t your cup of tea, how about nuts and bolts, or screws? Suppose I loosen a nut or two and back a few screws out; are you ready to buy your ticket? Most aircraft have, somewhere, a mechanical fastener called “The Jesus Nut”. It’s termed this because, the logic goes, if that fastener fails in flight the next face you see will be Jesus. The crux of these examples is this; the car, the computer, and the aircraft are all designed and constructed by an intelligent being or , usually, by a group of them. Each one has thousands, sometimes millions of individual parts; each part is itself designed and manufactured for a precise purpose; a simple aircraft bolt can have a set of specifications several pages long. Click on the image of the bolt and study it for a moment. 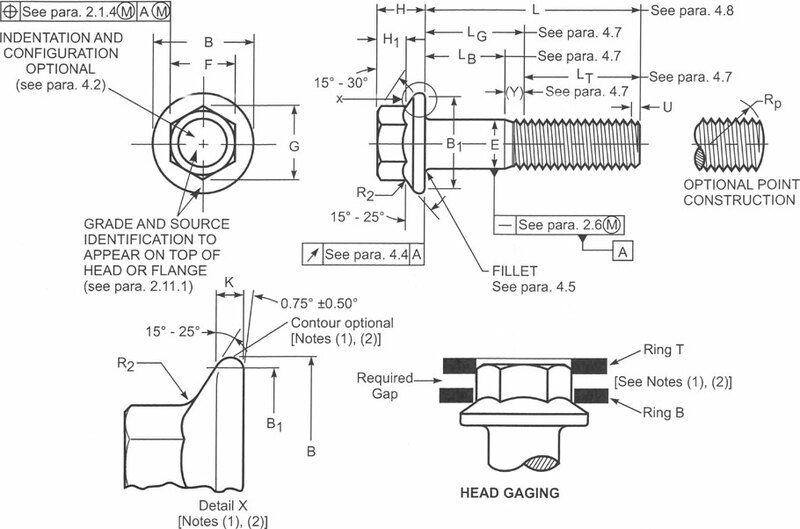 The drawings, lines, and numbers are a partial listing of the information needed to make this one item; not shown here are the data for the alloy from which the bolt is to be manufactured, the heat treatment of the finished part, or where the bolt is to be installed.Changing one of the specifications for making the bolt; the length, thread design, or hardness; can cause it to fail in its function. The evolutionary theory of origins contends that all life began with the randomly combined chemical elements and compounds necessary for a single living cell to be formed, SOMEHOW coming together, organizing themselves SOMEHOW based upon specifications that came from SOMEWHERE. Then by mutation and reproduction all life that has ever existed came to be. It used to be jokingly said that the equivalent of an evolutionary origin of life would be a tornado tearing through a junkyard and leaving behind a fully functional 747. It would be closer to the truth to say; The belief that life can arise from random chance is no less non – sensical than believing that a tornado can whirl through a junkyard and leave behind the Boeing Aircraft factory fully formed and functioning with 747s rolling out of the hangers with clockwork regularity. Fifty – two years ago the SETI [search for extraterrestrial intelligence ] project had its beginning. Since then millions of man hours have been devoted to the search for a sign of intelligent life in the universe. We have probed every corner of space that we can reach, looking for the faintest trace of life, past or present, and come up empty. On this good earth you cannot grab a handful of air, a cup of water, or a shovel full of dirt that does not teem with life. If the information contained in the genetic code of even the simplest life form on Earth were converted to a radio signal and received by one of the seekers of SETI, it would be hailed as irrefutable proof of an intelligent author. Just how loud does God have to shout, before we hear Him? Posted on March 26, 2012, in Evolution, Where This Road Goes and tagged creation, evolution, galaxy, genetic, genetic mutation, God, Jesus Nut, life, mutation, radio, SETI, space, stars. Bookmark the permalink. 2 Comments. In keeping with my belief that if you accidentaly kick a hornets nest, you should back off a few feet and chunk a rock at it, here is another earlier post to fuel the fire.